Diamond D-Jet certification has not happened yet. The time frame for Diamond D-Jet certification by Transport Canada and the Federal Aviation Administration is unknown at this time. 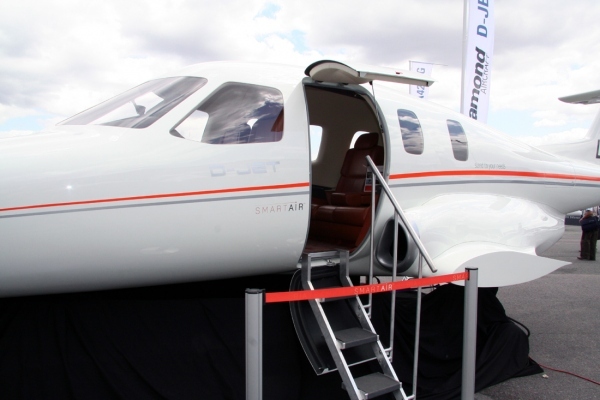 Diamond Aircraft announced in September 2011 that they we restarting flight testing of the D-Jet, however they have not said if the D-Jet will be in production soon. In February 2013 the D-Jet program was suspended. D-Jet certification will not happen until the program is restarted. The company does not have an outlook for the certification of the D-Jet. More information on the Diamond D-Jet certification will be provided when the D-Jet program is restared. Above Diamond D-Jet certification page photo by Georges Seguin on Wikimedia Commons. Photo (only) released under a Creative Commons License.